1. 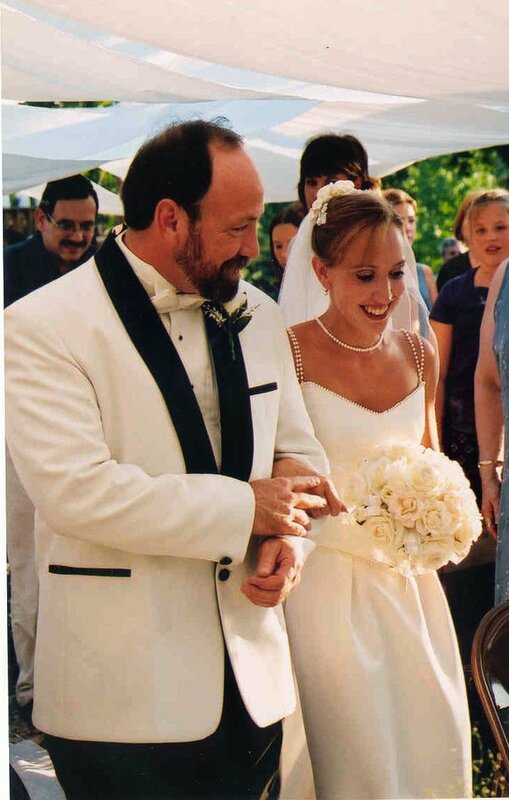 My father walked me down the aisle. 2. I married this man. 3. 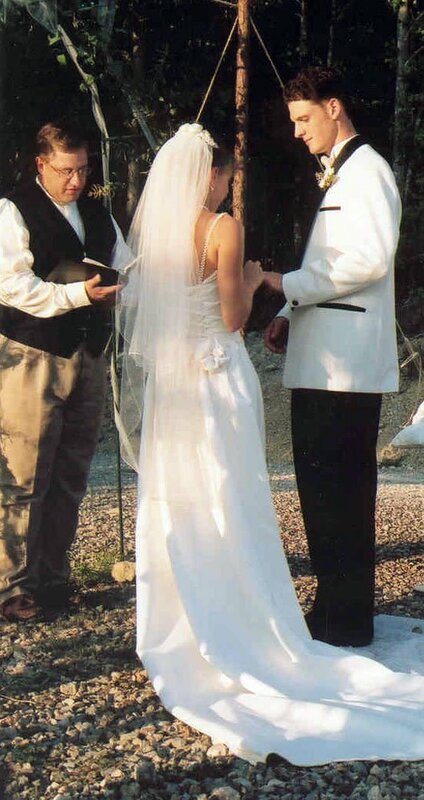 It was a record high of 105 degrees and the wedding was outdoors on my mother's property. 4. We threw the whole wedding for under $1200 (that also included dinner, wine, champagne, and beer). 5. Jason and I catered the sit-down dinner for 78+ guests making homemade manicotti (and sauce), side salad, baguettes (those were frozen & heated). 6. I have not made manicotti since. 7. 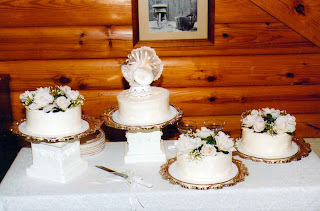 I decorated my own cakes: I bought four Italian Cream Cakes for $13 each from an awesome bakery then decorated with silk flowers, lace, and faux pearls. 8. My mother made my dress, veil, and bouquet (she also made my sister's who was married in June of the same year, hence only having $1200 for the wedding). 9. There was lots of dancing. 10. There was lots of drinking (and more dancing). 11. 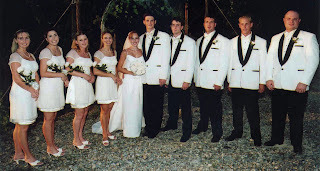 We had friends (who happened to be photographers) photograph the wedding. The only cost to us was film. There were no digital cameras being used so all pictures are scanned in, hence the poor quality. Sigh. 12. It was not a lavish affair, but it was "us." The idea was simply to celebrate. So, what were you doing 10 years ago? OR tell me some fun facts about your wedding. Awww, happy anniversary!!! 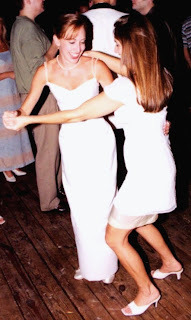 I loved reading about your wedding-- it sounds like it was a great one!! I can't believe you made manicotti for 80 people!!!! Happy Anniversary!!! Your wedding sounds a lot like mine! We did everything too and it was us! I love it! I hope you two have a great day and here's to a lifetime of happiness! Happy Anniversary!!! I witnessed a lot of weddings during my hotel years. The best weddings weren't the ones that people spent a lot of money on, but the ones where even the catering staff walked away and said those two people loved each other and two families came together tonight. Your pictures remind me of that feeling. Congrats. C.
I'd be heading off to school in a school uniform this week, 10 years ago. Scary! I love your wedding dress! $1,200! That is so cool! You should write a book on how to save on weddings! 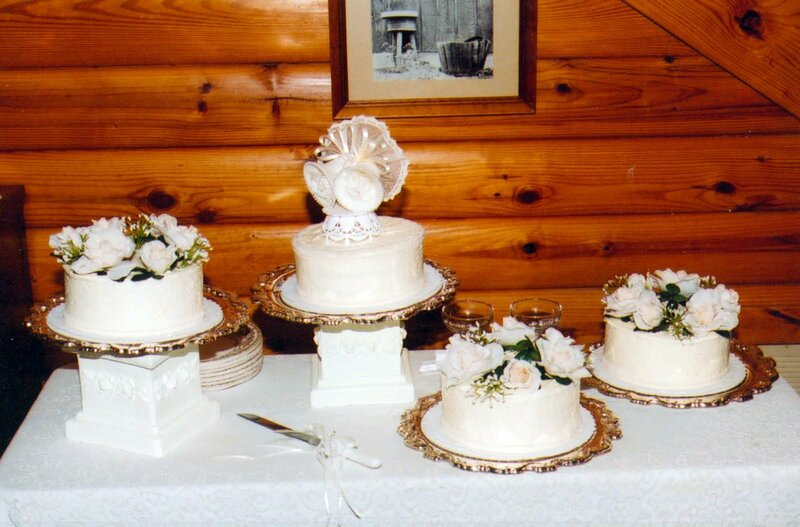 At my wedding (5 years ago) it was so hot in our reception room (even with the AC on) that our cake started to tilt a little and we had to do the cutting of the cake right away. The staff thought I would go bridezilla and freak out, but I didn't even care! Happy anniversary!!!!! Sounds very similar to my wedding. Next year is ten for us! Congrats and enjoy eachother and the day! Love these pictures! 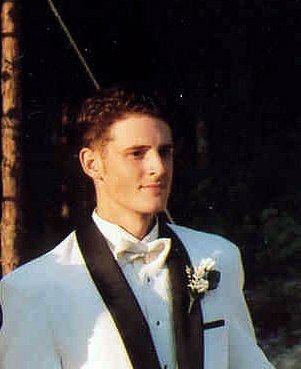 Your hubs is a handsome man! and its been a while since ive been to your blog, but it looks SO much clearner. Love it. And now I'm crying. Wow, how beautiful. Thanks for the story, it's amazing. Dayum on the budget - you need to write in a magazine about that, terrific! !Dancing and champagne, really all you need and family. Happy Anniversary to both you and Jason! What great pics. It looks like it was a great time with many memories and that is what is most important. You said your mom was a talented seamstress and you weren't kidding. The dress was beautiful. Happy Anniversary to you and Jason. 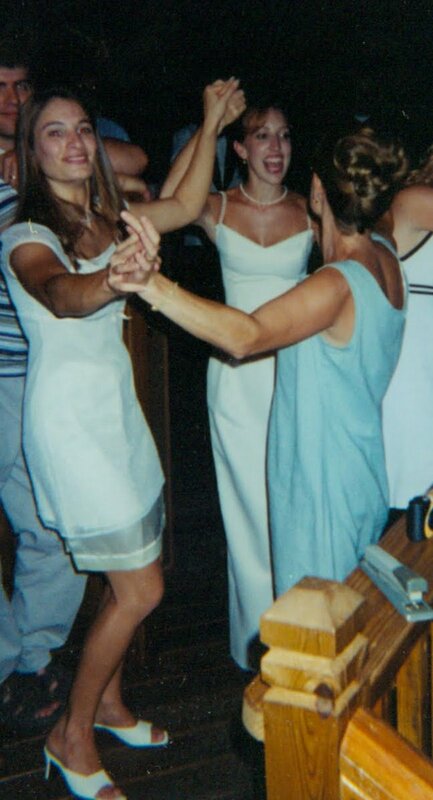 You were a beautiful bride and your mom is so talented. I'm impressed with your budgeting skills! 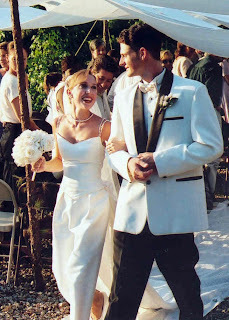 First off, I wish you and Jason the HAPPIEST 10th anniversary! I'm so impressed with you budgeting skills, would you do my wedding? (first, I have to meet my "jason"....). You looked gorgeous and I'm impressed that your marriage lasted. Thats rare these days! Sadly, my mother was very sick and passed away ten years ago. But honestly, she did SO much before she died that it was such a great year for us. Anna @ Newlywed, Newly Veg Thanks so much sweetie - in retrospect, making that much manicotti was a bit ambitious! Laura @ B Foxy Fitness Thank you, I wish I could wear it out tonight I liked it so much LOL. Kristy @ The Casual Dish Thanks so much! Sarena @ The Non-Dairy Queen Thank you so much friend. Sometimes doing everything yourself can be a good thing, it's done your way all the way. Frosty Duncan @ Hope in a Basket Thank you so much for your kind words. It was definitely about coming together and celebrating rather than spending tons of money and all the who's who nonsense. Kenzie @ A Healthy Purpose Thanks! Oh wow, to think back to being on your way to school again yikes. Kara @ My Wellnest Thank you (I'll be sure to pass that compliment to my mom). Yep, we were cheap cheap cheap LOL. Glad I'm not the only one with a super hot wedding day story. Sounds like you must have been having the best day not to stress about the cake. Dawn @ Florida Coastal Cooking Thanks so much! And happy 9 years for you. Nichole @ Live for the Run Awww happy tears only! Yep, hard to beat dancing, champagne and family. Alicia @ Vegan Epicurean Thank you so much dear! Yes, it may be another 10 years before I make manicotti again. Though, that would have been a really nice meal for this occasion huh? Eden's Eats Oh I am so sorry to hear that 10 years ago you lost your mother. I am very fortunate to have my mom! I would be happy to help do your wedding ;-) You'll meet your "jason" when you least expect it. 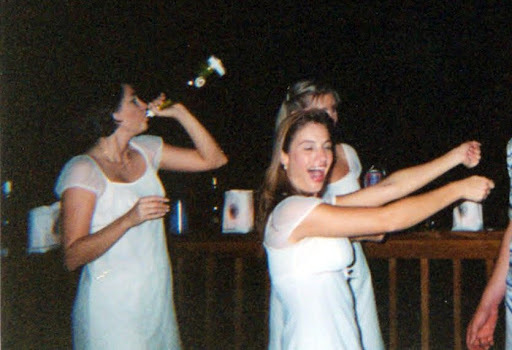 you are a beautiful bride... LOVE the photos, especially the last one - hee! happy anniversary!! I've only been married 3 years so 10 is amazing! Its fun to have your best friend as your hubby. 10 years ago I was starting college. Ahhh, its been that long. Crazy! Happy Anniversary to you and your handsome hubby!!! I love these pics!! Congratulations on 10 years! You made such a beautiful bride. 10 years I was 16! I remember getting my license and taking my first drive by mself. I thought I was too cool! haha. Heather! These pics are great! I particularly like the wedding party line up where all the gals are short and the same height, and the guys are all tall and appear to be the same height. Lindsay @ Cotter Crunch It's amazing how fast time flies I swear. Kris @ iheartwellness Thanks sweetie - we'll you're anything but chubby now! And you put me to shame with your eating. Sarah @ The Ordinary Vegetarian LOL guess I picked short friends huh. Wow, just starting senior year??? Ahhhh good times. Alyson @ Nourished Fitness Thank you ma'am!!! Also - good deal on the wedding! I thought we did good with ours being under 5K! LOL I love simple, smaller affairs. That's what we did and it suited us perfectly as well. Happy anniversary. I'm impressed by how DIY you did it and it looked like a perfect day! Wow 10 years ago I was getting ready to start my senior year of high school! Aww I loved this post! You look gorgous in your dress! I love that you did it all on a budget and it doesn't look like it at all! That's what I'd like to do for my wedding I'd hate to throw money at it when you can have a lovely day with your family and friends whatever the cost. Very impressed, I wish I could start planning my wedding now hehe :-) Congratulations! :-) just showed your post to Mike, he loves it too! Robyn @ Ramblings of a Wanna Be Writer and Runner Thanks so much! Oh so you're going to get to enjoy your 10 year reunion soon huh??? Wow!! I LOVE your wedding pics and story!! Amazing and a million times over - congratulations. That is so inspiring, and I couldn't be more happy for you two. I loved everything about your wedding, especially that it was you. THAT is what is missing from so many weddings and hence why I am so anti-traditional wedding personally. Let's see, 10 years ago? I was 20, in college, and had started dating my ex-husband the previous December. WEIRD! you have not aged in 10 yrs..maybe like you look 2 yrs older, that's it. you look amazing..then...and now!! 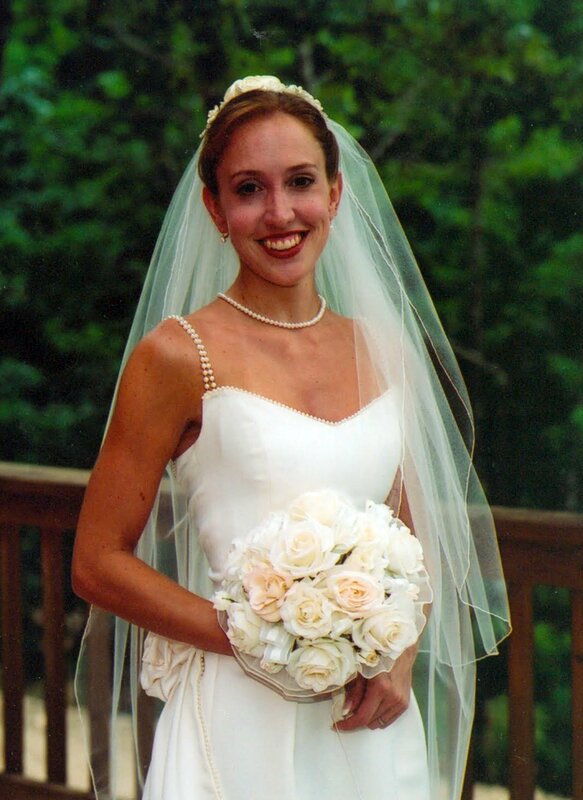 Happy Anniversary, Heather! Wow 10 years. And that wedding budget! Seriously, I'm going to have to get some tips from you when I get married. :) Hope you enjoy your weekend! wow, 10 years, that's great! happy anniversary! 10 years ago i was 17 and on a lot of drugs. yup. Happy Anniversary and I love all teh fabulous pictures, you were a beautiful bride and I love your dress. 10 Years ago DH and I were in Hawaii on our 3rd anniversary vacation, it was fabulous....my favourite place ever! What an amazing day! The dress your mom made you was gorgeous! 10 years ago I was 15 and living in England! What an amazing wedding for spending practically no $$$$$$!!!!! I love your dress too! Congrats on 10 years! We are almost there! Congratulations! I love that you catered the meal your selves! For my wedding I made the favors which were little 6-tier cookie cakes. Talk about a lot of work! :) Great pictures! Thanks for sharing! April @ The Weigh I Am Thanks girl! Eunice @ Food 4 Fitness I'll be more than happy to share some tips with you. Have a great one too! Janetha @ Meals & Moves Thanks girl. And look at where you are now - newly married, happy, healthy, and rockin' workouts! Bela @ It's Life, Max it Out Oh Hawaii - how nice! 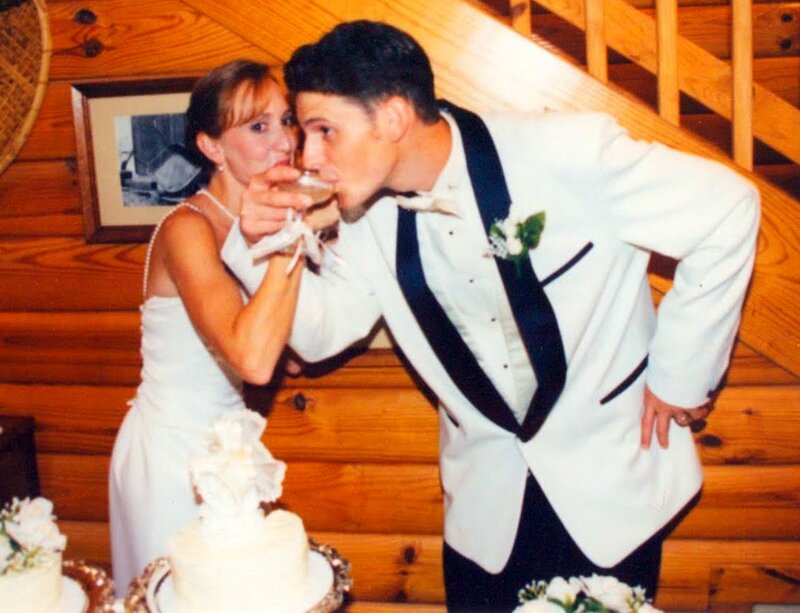 so happy 13 years to you. Madeline @ Greens and Jeans Thanks so much - I think she's pretty darn talented! Simple Daisy Thank you so much and congrats to you on approaching 10 years too. The Healthy Hostess Thank you! 6-tier cookies?? wow! Happy Anniversary! What a beautiful wedding - and so wise of you to do it well but on a budget. Can't wait to read about how you guys celebrated! 10 years ago yesterday I was heading into my junior year of high school.